Back in 2000, whilst trying to find the secret of stone circles, I became aware that woodhenges were associated with them. At the time this presented no problem as woodhenges were believed to predate stone circles. Indeed Woodhenge near Stonehenge was said to be about 4000 years old. One of the things that Woodhenge appeared to demonstrate was that woodhenges were structures in their own right, that is they were not part of a stone circle or some other structure. This was and is the belief of the archaeological world and it is considered by some that Stone Age/early Bronze Age man started using stone instead of wood when the wood ran out. By 2001 I knew that the classic stone circles such as the Rollrights and Stanton Drew were on woodhenges and in 2003 I got the DRG (Dowsing Research Group – Ed.) to dowse the woodhenge at the Rollrights. They were almost certainly the first group of dowsers to do so. As stones of the circles would often be on postholes the temporal relationship of the two did not present a problem. The woodhenges appear to consist of a central circular area coming up on a black and carbon witness. That is, it appeared to be a giant posthole. For a while my concept of what was there was that a tree trunk had been used. This view was reinforced by Seahenge in Norfolk. However, the size of the central area, 2m often more, led to problems with the tree trunk concept. The number of rings of posts appeared to be six on a radius of about 20m although the stones, when present, would not always be on the 6th ring. In some cases the stones would be inside the inner ring. The stone circle would not necessarily be concentric with the woodhenge. Possibly the best example of a mismatch between a dowsed woodhenge and a stonecircle is Stanton Drew. At the time I discovered this, it provided supporting evidence for woodhenges being older than stone circles and henges. However, in2004 Nigel Hughes and myself discovered that there were two sets of postholes and two henges. The stones relate to the later of the two. In April 2003 whilst on a water divining course in Snowdonia, I made the first of what was going to be a dramatic series of discoveries. At the time I, like most dowsers, believed that sacred sites were placed on top of two crossing underground streams often with a blind spring. As I was on a water divining course one way to find some underground streams was to locate a sacred site such as a woodhenge. After finding ancient roads and round houses I came across two lines of postholes. Soon I realized that I had found a woodhenge in the gardens of the Snowdonia Environmental Studies Centre. With time on my hands I decided to see if there was a grave at the centre of the henge. I had a whole range of witnesses with me including phosphate, calcium, gold, silver, bronze, iron. It was not long before I had outlined on the ground in the central black area the bodies of a ‘Prince and Princess’. The Prince had a bronze head dress, as did the Princess. The Prince had a bronze shield and an iron sword. The Princess had a gold tunic to the waist and jewellery. Two years later I, and my co-worker Nigel Hughes, know much more about the two people who are always at the centre of woodhenges. We still refer to them as Prince and Princess or envoys to the Earth Goddess. The following morning before breakfast, I revisited the site and established that they were in a walled tomb with three stone slabs on top of it and that it was deep, possibly twenty feet. At the time I did not know that every woodhenge would have a central tomb and considered the find historic and possibly unique. I therefore wrote a report for the Centre on what I had found. The next step was to check the woodhenges I knew such as Stanton Drew and the Rollrights. I was soon finding woodhenges everywhere, on allotments, playing fields, in my own garden, churches, and cathedrals. I only know of one ancient stone circle that may not have a central tomb and I suspect that that is because I have not looked at it properly. It is in the middle of a salt marsh. I can now look across a field of expanse of countryside and pick up visually where there have been woodhenges. Whenever I checked on the central tomb of a henge there is gold, silver and bronze. However, two things worried me, if I could pick up the gold why had it not been recovered? This thought occurred to me one afternoon and within minutes I was on my way to the fields. The countryside in Hertfordshire, in fact much of England, is pock marked by dells and ponds. There were at least ten dells, ponds and depressions in the ground within 30 minutes’ walk of my house. By the end of the afternoon I knew that they were all on woodhenges with a tomb at the centre. The Romans had beaten me to it although the absence of spoil heaps was a bit of a worry. However, I was making new discoveries about the henges all the time. One was the presence of bone depositories in the henge. Dowsers had for ages told me that I had a grave in the garden. I had investigated it and found a rectangular area coming up on phosphate. However, it also come up on an iron witness or what I used as an iron witness which was in fact iron oxide. I had assumed that it was a metal box with the remains of a departed pet inside. It was not until I depthed it and found it to be 15 ft. or more down that I realised that it might have something to do with the henge. Searches of nearby henges showed that there were four bone depositories in each henge, one on each quarter. But why bury the bones so deep and with iron? Were they buried? Soon it was clear that the bone depositories were connected to the central tomb via passages and a small triangular room or ante-chamber. I found that there was a complex underground temple which meant that either all the bones were deposited in one go or continuing access was required so more bones could be added as required. I already knew as a result of following a path from the centre of the henge that to the west of most henges was a dolmen. The bones came from this dolmen where bodies rotted until only the bones were left.The dolmens always have a phosphate halo round them stretching out one or more metres. If the dolmen had been constructed from stone it stood a chance of surviving to modern times either as two or three stones with possibly a capping stone or as one individual stone after the others were used for something by local people. 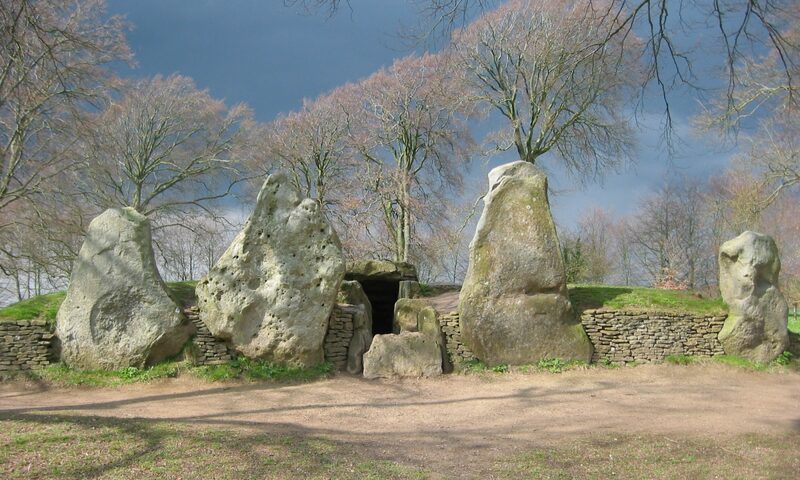 The dolmen indicated that access to the temple was required over the life of the henge. Also the very large number of temples with gold, silver and bronze in them indicated that some if not most of the metal may have been recycled. To do this access to the temple would be required at the end of its life as well as during the life of the henge. The question was – where was the entrance? The obvious place to look was the centre but there were no indications of any entrance in the circular black area. There was however one woodhenge that had been excavated in the 1920s: ‘Woodhenge’ itself near to Stonehenge. I knew that the centre had been excavated to bedrock so all I had to do was go and survey the site to see if it was an Iron Age woodhenge complete with underground temple. It did not take long to establish that it was. So I now knew where the entrance was not thanks to some lady archaeologist. However, I knew where the access tunnel had to arrive at – the temple – so all I had to do was walk round the outside of the 6th ring to see if I could pick it up. Three quarters of the way round I picked it up. I now knew where to look on all the other henges and when I did every one had its access shaft and tunnel. Although we have been working on how to identify chemical imprints for some time we still do not have a reliable method of identifying and distinguishing chemical stains from real objects. From what is underground to the above ground. For a long time I thought the woodhenges had six rings of post holes with the posts close to being on radii but not always. Then one day Nigel Hughes rang up to say that he thought he had found some more postholes outside the six we used to define the henge. He was right and the woodhenge was promoted from six rings to a 6 + 3 ring structure. This meant it was about 60m across not 40 to 45m. The henges are big, very big. To get some idea of their size visit Stanton Drew. The large circle has the stones on or about the 9th ring of postholes. If I remember correctly the small stone circle is on about the 4th ring of its woodhenge. The expansion to 6 + 3 brought the temple access shaft into the henge. We already knew that the access shaft was within a built structure, and this structure now became part of the henge. Six rings, a space, then three more rings. Why this design? Where did it come from? What is its significance? There was no shortage of questions. It is possible to follow the paths produced by people as they walk along defined routes. The carbon in one of the footpaths going out of the henge had led to the dolmen. If people are not wearing shoes the sweat from the feet leaves a track which can be picked up as sulphate. Things people are carrying or wearing may leave a track. It was while contemplating why the bone depository in my garden should be made of iron that I remembered that red ochre (red iron oxide) was used to decorate people and things including bones. A quick visit to my set of paint pigments and I had a red ochre witness. Some acid to remove the oxide layer from a nail and I had a pure iron witness. The bone depository did not contain iron but it did contain red ochre. The dolmens in the fields had red ochre under them. Following the footsteps of the priests as they walked from the dolmen into the henge, another patch of red ochre was found where the priests handed the bones over to another set of priests who were bare footed and standing in front of an altar. The plinth and the top of the altar can be identified from the chemical stain they have left in the round. What was sacrificed on the altar can also be identified. Such is the power of modem science-based dowsing. When on my travels in 2004, by chance, I came across a stone circle, the stones of which had been laid round a central big posthole. The owner had dug down to see what might be there but had only found red clay. Why red clay and what was it used for? Back home a red clay witness revealed the central area of all henges to contain clay even if they had been ploughed over. It now became clear what was at the centre of the henge. The centre of the henge was a pool of water and what I thought was a post was the organic matter that accumulates in pools, not a tree trunk. The pond appears to have a structure, it is not a simple round pond. Round the pool is a path and outside the path are seven altars. The above is just part of an ongoing study of woodhenges and the Iron Age. Ruskin said something along the lines – “architecture tells us all we need to know about a society”. The woodhenges and the stonehenges and surface temples that followed them will enable us to learn the secrets and lost history of the Celts and their priests the Druids. At the moment the only method that can unlock the door to this knowledge is dowsing based on scientific methodologies and procedures. A book describing the work on wood and stonehenges is being written and it is hoped to publish it by the end of the year. The EEG will be the first to know when it is due to be published. The figure shows the underground temple with the central chamber holding the tomb. Tunnels lead from the tomb via triangular ante-chambers to the four bone depositories. The seven rectangles are the altars on the surface. One ring of postholes is shown.